Does a loving God really send people to hell for all eternity? The questions you probably want answers to as you read this review are these: Is it true that Rob Bell teaches that hell doesn’t exist? Is it true that Rob Bell believes no one goes to hell? You’ll just need to keep reading because, frankly, the answers aren’t that easy to come by. How he asks the question is just as important as the question itself. “Has God created billions of people over thousands of years only to select a few to go to heaven and everyone else to suffer forever in hell? Is this acceptable to God? How is this ‘good news’?” They say that the person who frames the debate is going to win the debate. That is especially true when the debate is framed in this way, through these particular questions. You’re damned if you do and damned if you don’t. No offense, and no pun intended. It really says that. And it really means what you think it means. Though it takes time for that to become clear. Bell frames much of the book around time and place, around what the Bible means when it speaks of the when and where of heaven and hell. He points to Revelation 21, citing that the heavenly city, the New Jerusalem, is coming down to the new earth. He also affirms that heaven is a real place where God’s will alone is done and that at present, heaven and earth are not yet one (pp. 42-43). These are points that few Christians could seriously question. His argument progresses to this: Because heaven will eventually come to earth, if we’re to take heaven seriously, we must take the suffering that exists in the world seriously now. Therefore, we are called to participate “now in the life of the age to come. That’s what happens when the future is dragged into the present” (p. 45). In light of this, humanity’s role within creation is redefined so that we are not so much stewards as we are God’s partners, “participating in the ongoing creation and joy of the world” (p. 180), and engaging in creating a new social order with Jesus (p. 77). This language of partnering and participating is frequently applied by Bell to causes of social justice. But what about hell? Is hell a future reality or a present one? Is it an earthly reality or one that exists elsewhere? Understanding what Bell truly believes and what he is truly seeking to teach can be a battle. The reader will find himself following many rabbit trails and arriving at several dead ends. It seems that where Bell’s arguments begin to break down, he simply walks away instead of pursuing consistency and logic. This book could not stand the rigors of cross-examination. It has little cohesion, little internal strength. The reader will also find broad statements offered as fact. “At the center of the Christian tradition since the first church has been the insistence that history is not tragic, hell is not forever, and love, in the end, wins.” Is that true? It is easy to say, but can it be proven? Again and again Bell turns to the original languages but he quotes no commentaries, points to no sources. He says things like “’forever’ is not really a category the biblical writers used.” But he offers no proof. Again, it is easy to say, but can it be proven? Can it be proven from a legitimate source? Throughout the book he engages in what can best be described as exegetical gymnastics, particularly in dealing with the Greek word aion, a small word that is crucial to his arguments. While this word is commonly translated as “eternal” or “everlasting,” Bell argues that it can also mean “age” or “period of time,” or even “intensity of experience.” Using this approach, he briefly argues from the parable of the sheep and the goats (Matt. 25:31-46) that eternal punishment isn’t eternal, but rather an intense period of pruning. Now here’s the thing: aion and aionos definitely can mean “age” or “period of time,” they also mean “eternal.” The word’s context helps us to determine its meaning. So if we assume that these words primarily mean “age” or “period of time,” what happens when we apply that definition to John 3:16 where aionos is used? For God so loved the world that He sent His only Son so that whosoever believes in Him will not perish but have life for a period of time. Not as encouraging, is it? While Bell might argue here that “life abundant” might be a better fit (playing on the “intensity of experience” angle and tying it to John 10:10), at the end of the day, we’re left with an approach that gives more credence to living your best life now than it does to worshipping Jesus. Throughout the book, there are a number of points where we would agree with Bell, particularly when he identifies some of the goofy things that people have concocted to make God’s absolute sovereignty palpable. But his answers are equally unsatisfying. Even his good critiques are simply a bridge to bad conclusions. As he makes his case, Bell seems to delight in being obtuse, creating caricatures of opposing views that lack logic and compassion. He paints himself as the victim of the hateful, toxic, venomous denizens of certain corners of the Internet that believe “the highest form of allegiance to their God is to attack, defame, and slander others who don’t articulate matters of faith as they do” (p. 185). Thus, Rob Bell appoints himself a martyr for his cause, and anyone who disagrees with him is preemptively silenced. It’s a useful technique, that, but hardly a fair one. Meanwhile he acts as if those who hold to the belief that, in Bell’s words, “we get this life and only this life to believe in Jesus,” a view passionately held to by the vast majority of Christians throughout history, are blowing smoke rather than dealing honestly with the Scriptures. He subtly redefines the questions and answers, and in doing so, also shifts the battle lines. A God who would allow people to go to hell is not a great God, according to Bell, and the traditional belief that He would is “devastating . . . psychologically crushing . . . terrifying and traumatizing and unbearable” (pp. 136-7). God is at best sort of great, a little great—great for saving some, but evil for allowing others to perish. Dangerous words, those. It is a fearful thing to ascribe evil to God. So what of the gospel? Where is the gospel and what is the gospel? Ultimately, what Bell offers in this book is a gospel with no purpose. In his understanding of the Bible, people are essentially good, although we certainly do sin, and are completely free to choose or not choose to love God on our own terms. Even then he seems to believe that most people, given enough time and opportunity, will turn to God. 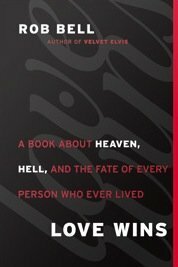 If Love Wins accurately represents Bell’s views on heaven and hell (at least if our understanding of the book accurately represents his views on heaven and hell), it reveals him as a proponent of a kind of Christian Universalism. He would deny the label as he tends to deny any label. But if it looks like a duck and quacks like a duck, well, you know how it goes. As soon as the door is opened to Muslims. Hindus, Buddhists, and Baptists from Cleveland, many Christians become very uneasy, saying that then Jesus doesn’t matter anymore, the cross is irrelevant, it doesn’t matter what you believe, and so forth. What we see Jesus doing again and again—in the midst of constant reminders about the seriousness of following him living like him, and trusting him—is widening the scope and expanse of his saving work. That is what we know as universalism. And it is cause for mourning. Christians do not need more confusion. They need clarity. They need teachers who are willing to deal honestly with what the Bible says, no matter how hard that truth is. And let’s be honest—many truths are very, very hard to swallow. Love does win, but not the kind of love that Bell talks about in this book. The love he describes is one that is founded solely on the idea that the primary object of God’s love is man; indeed, the whole story, he writes, can be summed up in these words: “For God so loved the world.” But this doesn’t hold a candle to the altogether amazing love of God as actually shown in the Bible. The God who “shows His love for us in that while we were still sinners, Christ died for us” (Rom. 5:8), who acts on our behalf not so much because His love for us is great, but because He is great (Isaiah 48:9, Ezekiel 20:9,14,22,44, 36:22; John 17:1-5). That’s the kind of love that wins. That’s the kind of love that motivates us to love our neighbors enough to compel them to flee from the wrath to come. And our love for people means nothing if we do not first and foremost love God enough to be honest about Him. This review was co-written with my friend Aaron Armstrong who writes at Blogging Theologically. All quotes are taken from an Advance Reading Copy of the manuscript that was provided specifically for review purposes; they will be verified against a final bound copy of Love Wins following the book’s release.